In Baby’s First Bank Heist, Baby Frank loves animals and he really, really wants a pet although his parents are not so keen. So what’s a baby to do? Baby Frank knows! He perfectly plans and plays out an impressive and unlikely bank robbery. Frank’s not a naughty baby, it’s just that he needs the cash to buy a pet for himself. After his seamless and successful robbery he proceeds with more improbable events for a crawling baby such as a little internet shopping and some significant animal harbouring. When Frank’s antics go too far and he is found out by his parents, life becomes concerning for them all. Luckily Frank’s dad thinks up a great plan. Maybe everything will be okay and Frank’s dreams of having a pet won’t be shattered after all. 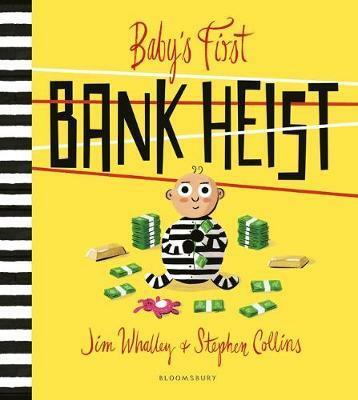 Baby’s First Bank Heist was fun and pleasing to read aloud with a rhythmic and rhyming flow. The cartoon style illustrations work wonderfully and pull the book together perfectly. I found myself having a giggle at the unlikeliness of a baby internet shopping, hiding a giraffe in a tree and not to mention performing a bank robbery! We value your comments, however, please note that all comments are moderated and need to be approved before publication, so spammers ... don't waste your time. All content is copyright Kids' Book Review 2018. All rights reserved. Republishing is forbidden. Powered by Blogger.